Breaking news: People tend to have very strong opinions about parking meters. Also, this surprise: Those opinions are never favorable. Yet Santa Rosa still has them, making it among the very few places in Sonoma county where the elusive meters can be spotted in the wild along with their related species, parking garages that charge money. And the reason we have them is because this is the city that time forgot – in Santa Rosa, it is always 1946. This is the second in a series exploring the missed opportunities and regrettable decisions that have shaped Santa Rosa since World War II. Part one (“THE SANTA ROSA THAT SHOULD HAVE BEEN“) saw voters narrowly reject a chance to develop part of the downtown core into a Civic Center, which would have kept it the county’s hub during the postwar boom years and after. No, Codding’s not to blame alone; with remarkable consistency, when challenged to make a momentous decision our trusted civic leaders boldly rose to the occasion and (in my humble opinion) made the worst possible choices. The courthouse was torn down and a street plowed through courthouse square; Santa Rosa Creek was buried in a culvert; prime downtown acreage was bulldozed with most of it turned over to private developers; a shopping mall was constructed which immediately became the Great Wall of B street. The city installed 510 parking meters in early 1945 and although the city printed helpful directions on how to use them, on the first day of operation “numerous persons inserted coins ‘just to watch them work’ but in many cases failed to turn the handle far enough to set the ticking device in operation.” When the first monies were collected three days later, the take included four slugs even though the graphic in the PD showed a little window on the meter claiming “SLUGS will show here.” Yeah, no. A nasty squabble immediately arose between the county and city over parking spaces. Santa Rosa had installed a row of meters on the east and west of the courthouse and the county was threatening legal action unless there was free parking for designated vehicles. As neither side was blinking, the county proposed it would turn the south lawn of the courthouse into a government parking lot, requiring chopping down two mature Peruvian pine trees – which were the last survivors from the pre-1906 earthquake courthouse plaza. The PD reported on the backlash: “The number and vehemence of telephone calls coming to this office since announcement of the parking plan indicate that the removal of those trees for the purpose set forth will meet with a storm of protest, like which our county officials have never before heard.” The city caved, but it was a stupid fight to pick; what did they expect? Jurors and judges would dash outside every two hours to move their cars? Then as Mrs. Larson poetically wrote, now comes it the crisis: the year 1946. Thousands of soldiers and sailors were returning home to Santa Rosa where they were promised free education and cheap mortgages by the GI Bill – but found jobs scarce and nowhere to live. The housing situation was probably worse than it’s been since the 2017 fires; a special census taken that February found only 74 vacant houses or apartments in all of Santa Rosa, including places leased/sold but not yet occupied and units where residents happened to be out of town. The Press Democrat’s “Wanted to Rent” classifieds were always long, packed with veterans pleading for somewhere with a roof. Sometimes a finder’s fee was offered, including nylons. The mayor explained that it is “not the fault of the meters” that the parking meters have not completely solved the parking problem, but is due to the “great influx of people into Santa Rosa.” He explained that traffic has become so great that “there just isn’t room for them” in parking space now provided. To pay for the lots and other civic improvements (including “electric stop-and-go signal equipment for key intersections”), the city council used bond money and authorized Santa Rosa’s first sales tax, to predictable taxpayer howls. Although the tax was only one percent, there were calls for a complete boycott of the downtown as a kind of “Boston Tea Party” protest. The Press Democrat’s letter section saw writers interchangeably angry between the sales tax and the parking meters, to wit: “I (Someone I know) will never shop again in Santa Rosa because I’m mad about a parking ticket (I already pay too many taxes).” But where else were they to go? Spend all that time and gas – now up to 21¢ a gallon! – driving to Petaluma for groceries or all the way to San Francisco for a fashionable hat? The very first real article in the Press Democrat about Montgomery Village appeared on April 30, 1950 and included this quote from Codding: “People do not like the inconvenience of looking for parking space, priming the parking meter and then walking several blocks between stores. Montgomery Village abolishes that inconvenience – all within one block of 750-car parking.” It had been a long time since Santa Rosa had heard such sweet and sensible words. 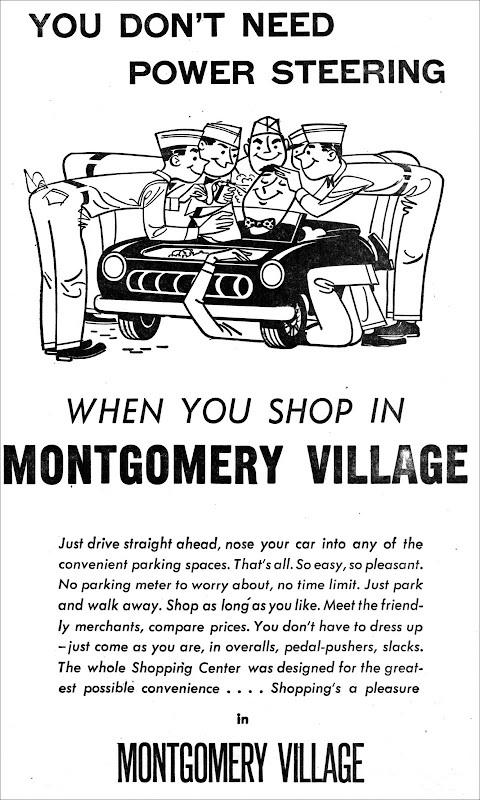 That appeared before the shopping center fully opened, and later ads would feature its other major draws: Montgomery Village was just outside city limits so there was no municipal sales tax and it had diagonal parking. To understand why diagonal parking was such a Very Big Deal, slip into a Dacron jacket and travel with me back to 1950. Cars and pickups are classy but clunky – as large as boats and heavy as little tanks. And because they don’t have power steering (not available on any car until 1951) they require the muscles of Popeye to turn the steering wheel if the tires aren’t in motion. Santa Rosa insisted upon parallel parking only, even though downtown merchants had been protesting it for many years. A petition for diagonal parking was presented to city council in 1940, headed by some of the top storekeepers: Lee Hardisty, Leonard Deffner, Donald Carithers and Irving Klein. Deffner, owner of the big Pershing Market between 4th and 5th streets, told the council that customers of nearby businesses were using his grocery store parking lot rather than parallel park on the street (and this is before the meters, remember). Nothing doing, said Santa Rosa – our streets are so narrow that anyone double parked would cause a traffic jam if diagonal was used. Apparently stiff fines for double parking weren’t a consideration. The city clung so hard to parallelism that in 1964 they made every third space no-parking so it would be faster to nose or back in to a spot, thus making the parking shortage 33 percent worse. Dumb decisions like that made Codding look like a genius by comparison. While Montgomery Village was thriving, Santa Rosa seemed to go out of its way to make downtown parking ever more annoying. In 1951 (840 meters now installed) they made a deal with a company to put frames on the meter poles which could display printed ads. Local merchants hated it, didn’t advertise and the company damaged many of the meters somehow. 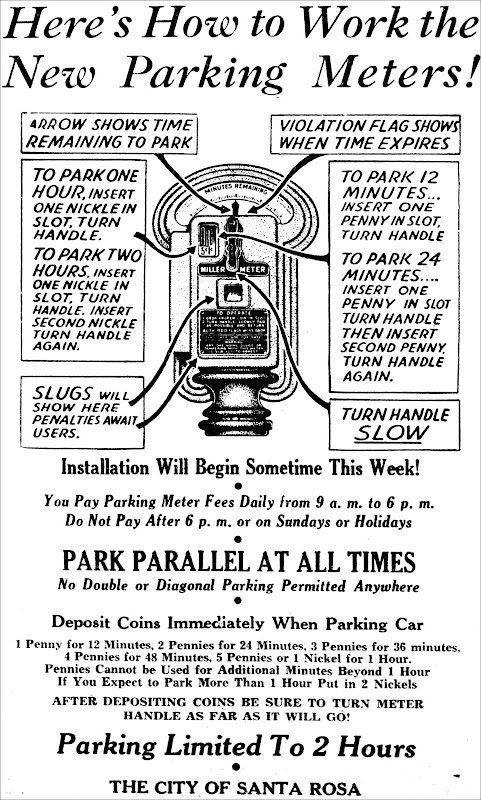 Two years later the city incurred more public wrath by switching parking lot meters to take dimes only, thus forcing drivers to overpay if their errands took less than two hours. Overtime parking fines doubled, then doubled again. Other Sonoma county towns followed Santa Rosa’s lead in the 1950s and installed parking meters, then later removed them under pressure from the business community. Healdsburg uprooted its meters in 1964 and the sales tax increase more than replaced lost meter income. Twenty years later Petaluma stopped meter enforcement and their Downtown Merchants Association saw business improve. Yet Santa Rosa’s confidence in the meters remained unshakable, even while the city continues to tinker with them; a decade ago they tore the meters off most posts because consultants insisted ticket kiosks were ever more efficient and the public really wouldn’t mind hiking from a parking spot to a kiosk and then back again. This year (2018) the city extended metered parking to 8PM while also implementing a zone system, which is able to increase the cost of parking in busy areas during the busiest times – which was done because experts told the city that trick works really well in tourist towns like San Diego. But still the ungrateful public keeps complaining and today the resentment over paid parking in Santa Rosa is louder and more frequent than ever before – although that may be because the forum has shifted from newsprint to social media, where everything is amplified and unedited. What’s interesting is how attitudes have not budged a whit between 1946 and now. People still say they no longer go downtown because they (or someone they know) was unfairly dinged with an expensive parking ticket. Businesses still say they don’t have enough customers because of the hassle of parking. And Santa Rosa still says there’s nothing wrong with the status quo – whatever that happens to mean right then. * There are no shortages of Hugh Codding anecdotes, but here’s a story I’ve not read elsewhere: While Santa Rosa was mulling over where to build the new city hall in 1950, Codding offered space at Montgomery Village – although it was then outside of city limits. According to the Press Democrat: “‘I thought myself it was fantastic until I got to thinking about it,’ he told the astounded [planning] commissioners.” Then as the city still hadn’t decided in 1963, he offered free land near Coddingtown in the unincorporated area. The city council didn’t snap up the deal so a week later he came back with an offer of another place, also on county land near his shopping center. And when they still didn’t bite, he tried to broker a deal to make city hall part of the new county administration center. Did he really believe he could get Santa Rosa to move the city buildings out of the city? After ignoring opportunities to celebrate Santa Rosa’s anniversaries that spanned 64 years, Tom Cox thought, “we should make something of it” in 1968. The real question, however, was whether they would be celebrating one of the events from the town’s early history – or the ongoing obliteration of its past. Cox was the long-time head of the Santa Rosa Chamber of Commerce and made that suggestion at a 1967 luncheon for the “Congress for Community Progress,” a coalition formed five years earlier by the Chamber, which claimed the Congress represented as many as 445 separate groups. Given that the town’s entire population was then only about 44,000, let us forgive any Gentle Readers who snort skeptically. Much was made in the 1960s about the Congress, which held occasional all-day assemblies attended by hundreds of “delegates.” While it was touted as an independent citizen’s group, its sheer size made discussion unwieldy and its objectives almost always seemed to mirror Chamber of Commerce and developer’s interests. The 1968 Congress report said Santa Rosa’s highest priorities should be “Payroll and Industrial Needs” and “Downtown Futures and Potential” – way down in the basement was the preservation of parks and historical sites. During the sixties Santa Rosa was wild about all things modern, and as with many communities, that meant enthusiastic approval of urban renewal projects. We were told it would mostly be paid for by Washington, our property values would skyrocket and we would end up with glorious cities of the future. In 1961 a scale model of a proposed Santa Rosa redesign circulated around several bank lobbies. The model (“as modern and carefully engineered as the latest model of a star-probing rocket” – PD) portrayed a downtown designed for pedestrians, with mini-parks, tree-lined boulevards and a greenway along both banks of a fully restored Santa Rosa Creek. It was mostly bait and switch, of course. Prime locations owned by the city were sold to private developers; the Santa Rosa Urban Renewal Agency held sway over forty acres of supposed “civic blight” and much of it was scooped up by investors. Luther Burbank’s old house and gardens survived the bulldozer, but the home he custom-built in 1906 on Tupper street – the one seen in all the pictures of him with Edison, Ford, Helen Keller and other celebs – was deemed worthless, as it was argued that the town had no need for two Luther Burbank landmarks. By the time Thomas Cox spoke at that 1967 Congress for Community Progress lunch, great swaths of downtown was already scraped down to the topsoil and most of the rest would follow soon. The great courthouse was gone; the Carnegie library already had been replaced by what we have now. The parks were forgotten and their earth was destined to sprout bank buildings and metered parking lots. The lovely, free-flowing creek was entombed in a box culvert. Community Progress! Cox’s talk came a few days before the dedication of the “plaza on Old Courthouse Square.” The Courthouse Square site had been already split by the street connecting Mendocino Ave with Santa Rosa Ave; what they then called the “plaza” was just the western section between that new street and the Empire Building block. The east side was slated to be sold to private developers for commercial buildings. Adding insult to injury, Mayor Hugh Codding said the tiny plaza would make citizens “more aware and more proud of this historic center of the city of Santa Rosa,” and a supervisor chimed in this “perhaps what was in the mind of Mr. [Julio] Carrillo” when he donated the land to the public. Uh, no, times two. The sale of the east side of the plaza was successfully fought by a small band of preservationists – despite being told it must be sold in order to pay off the urban renewal bonds. Sadly, they lost another fight to stop the giveaway to developers of the sheriff’s office and city hall, now the location of the U.S. Bank building. They had hoped one (or both) of the post-1906 quake buildings could be saved to create a Santa Rosa museum. And now we come to the March 16, 1968 centennial, when Santa Rosa celebrated pretty much everything except its origins. Two time capsules were dedicated. (They were originally in front of the Empire building but now are facing the intersection of Third street and Santa Rosa ave). One was intended for 2068; the other was supposed to be opened on March 16, 2018. As our sesquicentennial event isn’t scheduled until about six months later, it only makes the choice of a September date seem stranger. That was just the “Centennial Day;” the “Centennial Week” was the Rose Festival in May, and there wasn’t much of a nod to history there, either. There was a two-day “western extravaganza” at the racetrack with stunt riding and a race between a horse and a motorcycle, a tennis match and a little regatta on Lake Ralphine. A rock concert included local bands “Wonderful Mud” and “Bronze Hog.” During the Rose Parade, the Marine Corps Reserve presented a bizarre little scene in front of the reviewing stand where they enacted flushing a Vietcong soldier out of a rice paddy and shooting him dead, right there on Fourth street. As I always say, these kind of events are really for the children. While 1968 may have been a bust as a centennial year, it was the definitely the year to celebrate Pepper, Santa Rosa’s lovable or maddening downtown character (depending upon whom you asked and when). When she wasn’t heckling hippies and jaywalkers, she was popping in the backseats of cars waiting for the stoplight to change and expecting the driver to take her somewhere – the Pepper stories are legion. But Pepper also collected quite a bit of money when local groups were having charity drives, badgering each passerby for spare change. That March she was the guest of honor at a Rotary luncheon and in October she was feted by the Lions Club. She was not included in the parade (and someone griped about that in a letter to the PD) but she sat in the VIP bleachers alongside Mrs. Luther Burbank. She was also made honorary town marshal for the Centennial Year, a position she undoubtedly abused with relish. 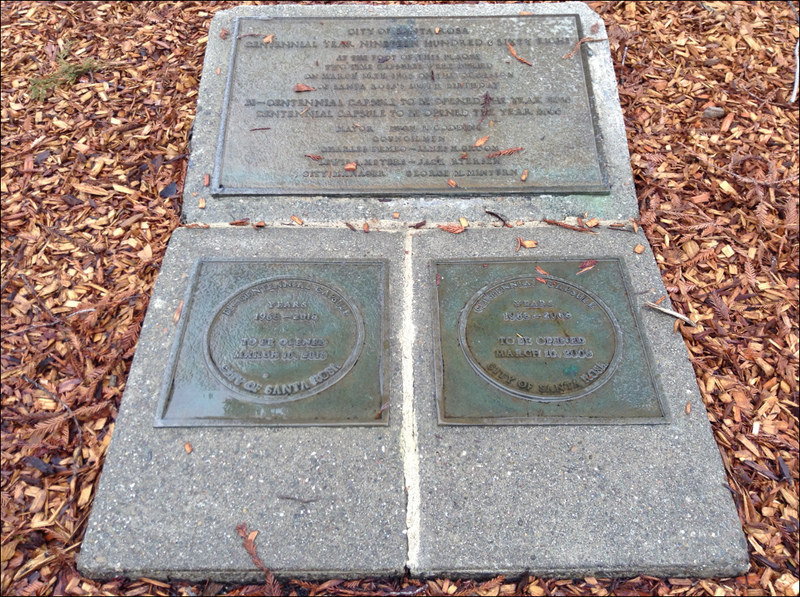 The time capsules are Santa Rosa’s only real historic legacy from 1968 – and note that the one to be opened this year is mistakenly labeled “Bi-Centennial,” showing no one noticed or cared that wasn’t the right word for a fiftieth anniversary. The March 17 edition of the Press Democrat offered a fat section of all things it deemed centennial-ish, and reflects the attitudes of the time quite well. The actual history section – meaning the 1906 quake and everything before – isn’t very long and just a superficial rehash from the county history books. However there’s some good wonky stuff about the development of city departments and such in the early 20th century, along with some photos I’ve not seen elsewhere. So as it turns out, the judge who saw the centennial as “[shaping] the history of the future” probably did hit the right notes for 1968. And in kind of a Believe-it-on-Not! coincidence, we’re grappling with very similar issues today, trying to wrestle with how the town will be reshaped in years to come because of the fires. There’s one more historic year to mention, for the sake of completeness: 2004, the real sesquicentennial of the year the town actually put down roots. A columnist for the PD complained “no one is celebrating,” and that a fund drive to support the reunification of Courthouse Square was going nowhere. Well, Courthouse Square is now glued back together. That columnist was Chris Coursey, now Santa Rosa’s mayor. And like his predecessors, I’m sure he’ll steer the sesquicentennial to be more of a rosy view of our future than a contemplation on our rougher past. The date will still be wrong on the time capsule, of course, but Chris could fix that – I’d even provide a little bit of duct tape and a magic marker to change the inscription to read September 9. Dear sir or madam; the city destroyed your pioneer ancestor’s grave marker. You may want to hire someone to make a new one. Sincerely, Santa Rosa. No mistake about it: Santa Rosa’s Rural Cemetery was a real mess in 1951. Alas, the old cemetery had been long neglected, but 1951 was apparently a pathetic low. Overgrown with sweet pea, blue periwinkle, acacia, bramble, poison oak and sapling trees, it must have taken decades to build up enough thicket to conceal a tombstone as tall as an eight year-old child. There were community cleanup efforts in 1907 and 1908, but after that plots were weeded only by the occasional family member – and presumably by undertakers preparing a grave for one of the diminishing number of new burials. The year 1951 as well would have likely passed without anything done had it not been for the vandalism incident. For reasons unclear, it was decided the monument company needed written consent from relatives of the deceased before they could repair damaged tombstones at the Rural Cemetery. But very few wrote to grant permission; the PD noted “survivors of many whose graves were mutilated have themselves died or moved from the area.” Doubtless there were others who lived around here but didn’t even know there were family members up on the hill, hidden somewhere under the weeds. And that was the nub of the problems with the Rural Cemetery; nobody took responsibility for the place. It was outside Santa Rosa city limits. Most of it was supposedly owned by the Santa Rosa Rural Cemetery Association, but that organization was long defunct and there were no records to be found. According to the Recorder’s Office, the last time a burial plot had been sold was in 1930. Shift forward now two months. Northern California had sweltered through a long hot summer and nearly every day the papers reported there were fires burning out of control in the forests. About then, City Manager Hood and other officials apparently remembered there was a vandal-friendly, six acre tinderbox right on the edge of town. “It’s getting so we can’t sleep night worrying about the situation,” Hood told the Board of Supervisors. “We could have a major catastrophe on our hands” if a blaze at the cemetery jumped to surrounding neighborhoods. Hood’s proposal was that a workcrew of twenty prisoners from the county jail should be provided to clear the weed-choked narrow roads winding around the cemetery. Following that there would be a controlled burn, supervised by the city fire chief and firefighters from the state Forest Service. The only objections to the plan came from Supervisor William Kennedy of Sebastopol, who was worried about setting precedent by using country jail labor. “There are plenty of other cemeteries in the county which aren’t in good condition,” he said, adding a cleanup at the Pleasant Hill Cemetery was paid for privately. The decision was that prisoners could be used because fire prevention was in the county’s interest, but no money would be spent to “beautify” the cemetery, which presumably meant resetting pushed-over monuments. “The resulting improvement of the neglected cemetery’s appearance will be only incidental,” summarized the PD. Thus on August 25, 1951, the Santa Rosa Rural Cemetery was burned in a controlled fire. Some wooden grave markers were inadvertently destroyed, when the burning revealed a number of plots that had lain concealed for years. An attempt will be made to trace families of those whose graves were hidden, City Manager Sam B. Hood said. He indicated that “private arrangements” will have to be made, since most of the cemetery is outside city limits. It was a true Pyrrhic victory – Santa Rosa had “saved” its historic cemetery, and in the process, destroyed many of the oldest markers that made it historic. It is a loss that plagues historians today. We can argue the city and county should be held blameless; the thick overgrowth completely concealed the old wood markers from the fire crews and conditions at the cemetery truly represented a serious fire risk. Or we can also argue it was irresponsible to do it in such a great rush and on the cheap. But whether by accident or carelessness, it’s difficult to defend Santa Rosa’s stance that descendants were responsible to make their own “private arrangements” to replace what was destroyed by the city. As the obl. Believe-it-or-Not footnote, there’s an unseen player to be spotted in all corners of this story: Hyperactive developer Hugh Codding. But there are cosmic ironies in Sam Hood’s appeal to the Supervisors for an emergency prisoner work crew, which he said was based on the threat a cemetery fire posed to “the Codding Village area.” Hood was then new to the post of City Manager, and three years later would be locking horns with Codding over whether Montgomery Village should be incorporated into the city. By eliminating the greatest fire risk in the area, Hood also lost a major bargaining chip – no longer was there urgency for Codding to compromise in order to ensure his sprawling subdivisions were under the protection offered by Santa Rosa fire stations. EDITOR: There are many men and women buried in the Rural Cemetery who were well known and well liked citizens of Santa Rosa. When alive and active in making this city “Designed For Better Living” they gave their time, money, labor and they paid taxes and had hopes for the progress of Santa Rosa. Now they seem to be forgotten, with but few exceptions, and to show how shameful all this is, just take a walk or drive through this cemetery. It is a disgrace to Santa Rosa. Why do we neglect the respect for our dead? When you read the names on the headstones of many who were well known, and see the condition of them, you wonder why something is not done to care for this cemetery. ..You may say the relatives of the dead should clean it up. Some whole families are buried here and no one left. Others have moved away. Decency demands that some provision should be made to clean this cemetery, at least, before Memorial Day. I have been told the Board of Supervisors are responsible for this condition and I hope that everyone interested in cleaning up this terrible condition will demand some effort be made to clean up this condition which is a disgrace. Let us not forget and forsake our dead. FRED A. COOKE, Commander, United Spanish War Veterans. …Why not call up your favorite supervisor or several of them, and they will possibly arrange to have the county jail prisoners do the clean-up work under the supervision of the city or county park gardeners, or let them use common sense. …Their resting places are, in some instances, almost a forest, with weeds, underbrush and young trees making it almost impossible to walk through the roads, and in some cases, impossible to locate tombstones, let alone the markers of the revered dead. Shame on you, Santa Rosa and community citizenry. Do you want your lot to be the same? EDITOR: I hope that the public will read the following lines and be as serious about the entire matter as I am. I am sincere and have no thought of sarcasm and I have a great deal of respect for Mr. Hugh Codding, and feel that this town and Sonoma County are indeed fortunate in having as progressive a man as he in regard to his terrific subdivisions. There has been much comment regarding the terrible condition surrounding the cemetery at the end of McDonald Ave., and I, too, feel that this is one of the most disgraceful situations we have in this beautiful city of Santa Rosa. Everyone feels that something should be done to correct this unsightly condition, but there seemse to be no heads or tails as to what should be done. Now if Mr. Codding is able to move the bank which was to be built on 4th street to the Codding subdivision in Montgomery Village, and if Mr. Codding was able to get a permit to build a theater in Montgomery Village, and I think if he tries hard enough he will move the court house to Montgomery Village–if all this is possible, why isn’t it reasonable to believe that with a little encouragement Mr. Codding could move the present cemetery and clean up the terrible unsightly condition that exists? EDITOR: I am wondering how many have been through the Rural Cemetery since the recent cleanup and just what they think of it. For years it has been a disgrace to the community with its majority of unkept lots and weed-covered roads. Now we have acres of blackened fire-swept stubble, smoke-covered monuments, burnt wooden markers and scorched trees. Surely it is a showplace for a “City Designed for Living” to be extremely proud of.